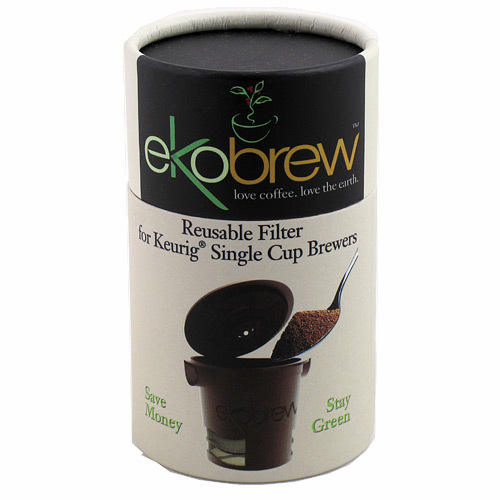 Sorry, we are currently sold out of 'Ekobrew Reusable Filter for Keurig'. Please check back later. If single serve electric brewers are your preferred method of enjoying coffee, the Ekobrew filter basket is the most environmentally and user friendly one on the market. With a low tamp dispersion cone for even wetting of coffee grounds, a smooth and easy to clean surface, and a sturdy silicon seal, the Ekobrew produces a fine cup of coffee time and again. It is compatible with most Keurig 1-Kup brewers and allows you to insert and remove without the hassle of taking out the filter holster. Moreover, the Ekobrew contains a deeper filter basket as to allow enough coffee for a stronger cup, if desired. This is a well designed product.